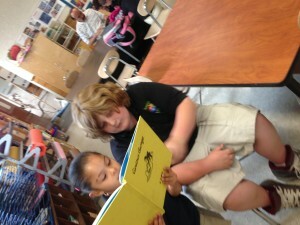 Down below is a picture of one of our fourth graders taking the time to help a kindergartner how to read! Nik always helps kindergartens with their homework and in making them feel like they are important. He even asked if he could show and teach them about our four core values. When asked how he was going to teach them he said , ” I’m going to do what staff do… Role model! Our staff at Betances Elementary constantly show how we are living our cause and trying to make impacts on children who need role models. After hearing that statement we know that our values and our role modeling have proven how we live our cause! This entry was posted in Uncategorized by Jordan Long. Bookmark the permalink.